ARIEL, WA. 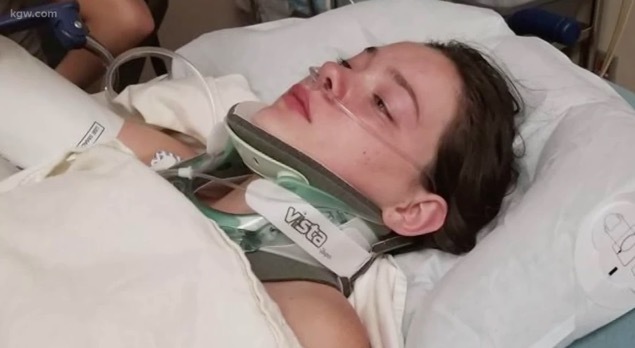 (THECOUNT) — Southwest Washington teen, Jordan Holgerson, is recovering in the hospital after a “friend” pushed her off a bridge near Moulton Falls in Ariel, WA. Holgerson, 16, was swimming at the popular local swimming area last Tuesday where she says she considered jumping off a 60-foot bridge into the Lewis River below. But once she saw the distance, she changed her mind. That’s when, one of her so-called “friends” pushed her off the bridge. Although not uncommon for thrill seekers to jump off the bridge, the push is believed to be responsible for Holgerson’s awkward landing. “I have five broken ribs, air bubbles in my chest, and I have a punctured lung,” she later told KGW8 from PeaceHealth Southwest Medical Center in Vancouver, Washington. “I could’ve died,” she added. Holgerson says her friend has since apologized, but Holgerson says sorry does not cut it. Make sure the “friend” takes care of the medical bills.